Do you send packages or letters up to 2 kilos and they fit through the mailbox? Then the mailbox shipments are the perfect shipping option. Through our collaboration with Sandd you can send your letter with Sandd and your labels are immediately franked. Mail items are collected, weighed and counted by Sandd. The minimum shipping value of your mail items must be € 17,50. If you do not get this shipping value, the amount will be added up to € 17,50. 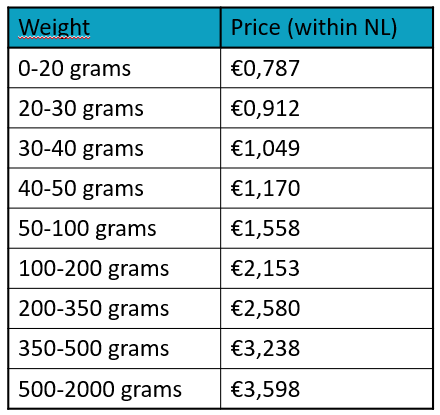 As of 15/02/2019 minimum shipping value will raise to €19. Based on your sent mail items you will receive a collective invoice. Costs are based on mixed batch mail. This means that the average weight of all mail items is used and you pay this rate per item. 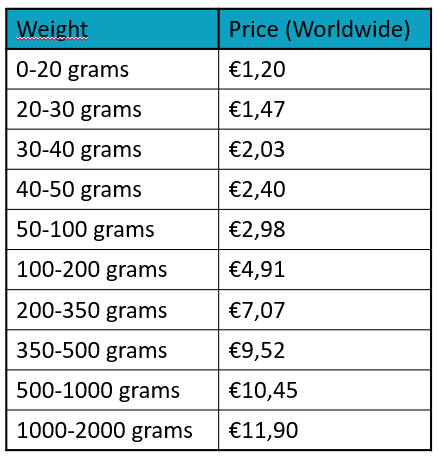 The table below provides insight into the rates per weight. The average weight of all your items determines your rate. As from 15/02/2019 foreign rates for Sandd will change. Below you can find the pricing valid from 15/02/2019. Like every carrier, Van Straaten Post has drawn up a documentation about their General Transport Conditions. If you deviate from the conditions, a surcharge will be charged on your invoice afterwards. When you send with Van Straaten Post, you automatically agree with the following conditions.